Since our last visit the carpenters have all been on holiday so we weren’t sure how much progress would have been made, but we were pleasantly surprised. Kris had plenty of questions regarding shelves in cupboards, how many, would we like them fixing in place or to be able to adjust their heights etc. As most cupboards I know what will be going into them I made a list of large items to measure which would determine heights of shelves. The back steps were in place, these are held in position by a big keyhole bracket. This means if you lift them they will become detached from the rear bulk head. One question from Kris was how we wanted the lower doors on the rear cupboards to work. One single door or a bi-folding door with a bolt in the middle. We opted for the bi-folding door. 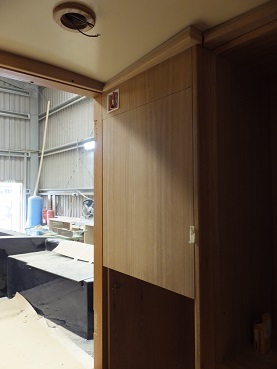 This means we can lift the steps and position them so that they sit vertically against the rear bulk head, the then exposed side of the cupboard door will be able to open giving us access to the lower cupboard. But should we need the whole door to open the steps will need to be removed, the bolt in the middle lifted and the cupboard door will fully open. Discussions with Louis about the engine bay and positions of the various items going in there brought up that it was all going to be very tight with the boiler and hospital silencer. 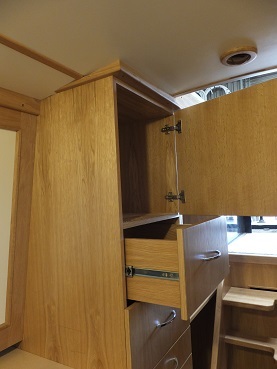 The lower starboard side cupboard was intended for my work tools, but Oleanna has more storage than our current boat so these could quite happily be relocated elsewhere so that the boiler can be housed in the cupboard. 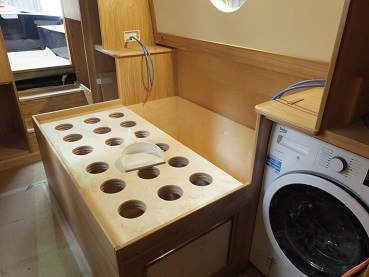 This decision was made as the Boat Safety regulations were complex for the boiler (gas) to be in the engine bay and the instillation would be a lot easier in the cupboard. This also frees up space in the engine bay. The fridge is now in position and just needs a final adjustment. The bike slot next to it has now a finished drawer below with handle. Not sure what will go in here as yet, maybe shopping bags. 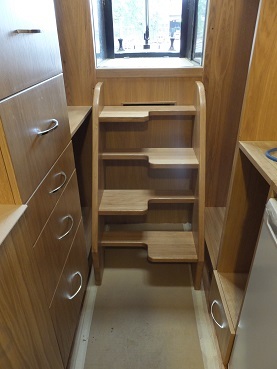 All drawers on the drawer tower have handles and the position of a shelf in the top cupboard was discussed. The cooker position has been tweaked giving us a bit more space between it and the dishwasher opposite. 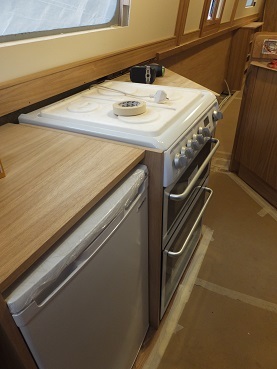 The wooden surround has been brought forward to cover the sides of the cooker and also help anchor it into position. The granite work top will curve out to meet it. Samples of worktop were looked at, there was one that was close, but not quite the one we have in mind, so a new sample will be sought for us to look at next weekend. 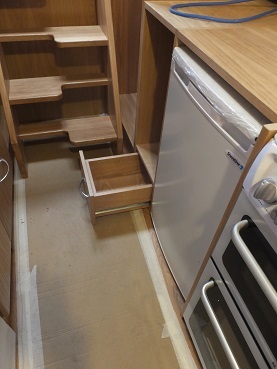 A stainless steel guard will be put over the woodwork on the cabin side to protect it from the rear burners on the hob. 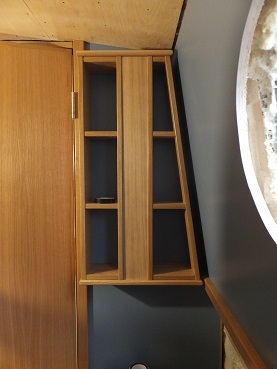 An adjustable shelf has been added into the triangular cupboard. When this is closed it pulls out on heavy duty drawer runners so that you can access the corner cupboard. This cupboard will have a pan drawer at the bottom so that I can pull it out into the gap and access right into the back corner without having to empty everything out. Above this will be a shelf for things that don’t get used quite so often. The freezer is now in it’s drawer under the dinette. There is a small amount of space next to it to be able to slot something else in the drawer, not sure yet but I’ll find something. 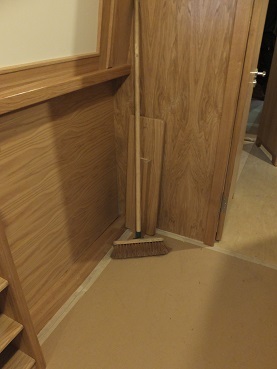 The broom sits where the corner bubble stove will be positioned. 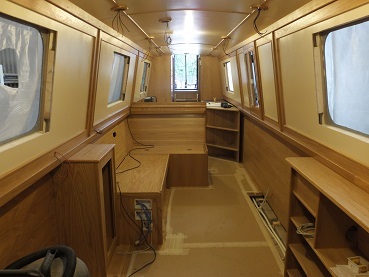 As the small shelf unit was in position and the trim has been fitted on the underside of the cabin sides I was able to measure up for the sofa and pouffe. The gap under this shelf unit will enable the pouffe to slide into the corner out of the way of the door into the bathroom. It will pull out to either be sat on or lengthen the sofa to make a single bed. We now need to arrange a visit to Bradford to see Michael at Sofa Bed Barn to get the sofa made. 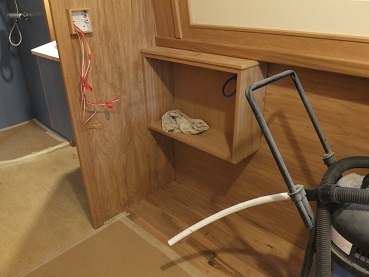 The small box on the bulkhead is for light switches. Looking down the cabin towards the stern. The ceiling panels are now in, the light surrounds are up waiting for the fittings to go in. Trim on the joins of the panels is mostly up, just a few bits missing. The windows are on order at Caldwells. The gap in the floor on the right is where there will be a radiator. The floor will be filled in once the plumbing is sorted. 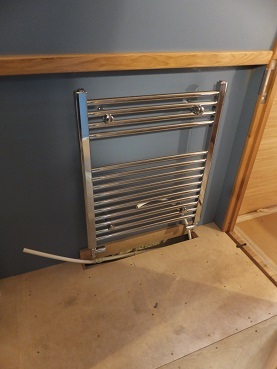 The towel rail is in position in the bathroom waiting to be plumbed in. The flooring for the bathroom will be ordered shortly. 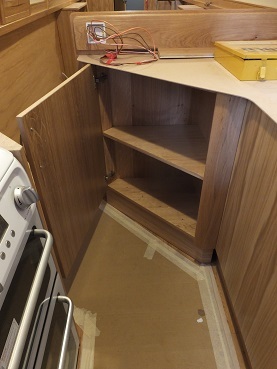 The sink cupboard is in position and doesn’t need supports on it’s front edge. The position of the sink needed finalising. 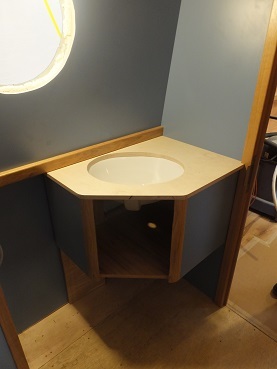 At the moment the top of the unit is only a mock up and the sink has been centred on the doors. If it wasn’t for the gunnel it would look fine. However as soon as I saw it it looked odd, so it will now be centred on the top, front to cabin side. Just hope it looks more meant than it does now. 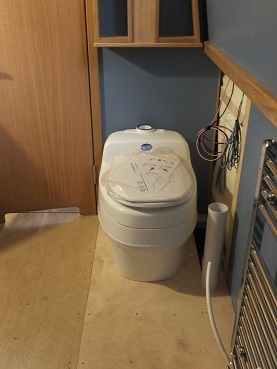 The composting toilet is now in situ and the plastic urine tank is under the floor. The toilet only comes with a short length of vent pipe which would reach up under the gunnel, but our pipe needs to reach the roof. A hunt is on for the right diameter pipe to be able to extend it. This shelf unit will cover the majority of the vent pipe and be handy storage. The bedroom is all in position now. Wooden handles will be used on cupboard doors. 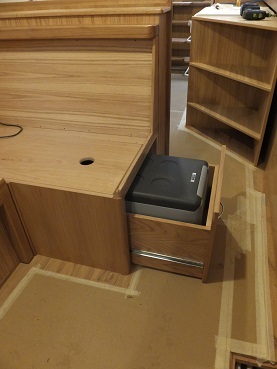 But the two big drawers under the bed will have handles similar to those in the galley to cope with the weight that they will have inside them. The water pump is in under the steps and cupboard doors are going on. Trim up to the ceiling is also being made to fill the gap above cupboards. During our visit we got to meet Kim who will be doing the upholstery and curtains for Oleanna. We discussed how I wanted the curtains to work, a choice of three hanging methods. Tab tops, eyelet tops, or just a sleeve in the fabric. The later is what I went for. I like curtains to be functional, cut out the light and keep you warm, both the other options would let an amount of light in even if they are blackout lined. In the bedroom our front doors have little surround to them, which may cause us a problem as we were wanting to have a blind here. The amount of space for fixing a blind isn’t good. On our current boat we have roller blinds that are quite compact and are spring loaded. If we can make one of them work for Oleanna that would be good. Photos were sent later on to Kim, measurements need to be checked over. Our bathroom portholes will need some form of covering, spring sunshine can flood a boat at sunrise even through the smallest of windows. Curtains would look wrong though so it was decided to have a couple of bungs made to fill them. These will need rubber backed fabric so some samples have been sent off for. Blinds in the galley will have to be fire proof so more samples are on their way with a hope that we can get a colour to match the curtains. Hopefully all the samples will have arrived by next weekend when we will next visit as Finesse and Tyler Wilson are having open days. At the weekend we will hopefully be able to have everyone in the same room at some point to have a final discussion about the batteries, lithium or wet cell? This entry was posted in Uncategorized on 12th Sep 2016 by pipandmick. I'm leaving a comment here rather than the other blog, because WordPress comments never seem to get through! Have you checked out a worktop stuff called Silestone? It's made of Quartz, and is meant to be almost indestructible — certainly much less prone to cracking than granite is, so should be able to be thinner. It also comes in masses of colours. Thanks for the info Adam. We'll look into that. so those push open/close cupboard draws (no handles) were a no go? to flimsy for the cut is guess..
HI RigbyWe have a couple of those in our house and they look great. But they annoy me when they don't want to open and you feel a fool pushing at a piece of wood until finally you find the right spot! Oleanna does have a couple of them under the dinette. Thankfully these won't be doors we need to open on a regular basis.